Wouldn't you know it. 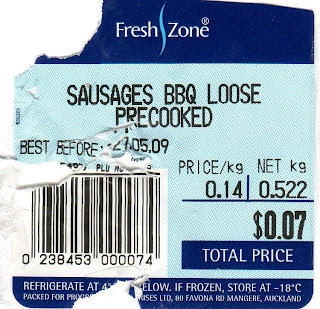 In a week when someone gets $10,000,000 mistakenly put in their account, I score a packet of wrongly priced sausages. Think about all the people who have failed to pick that error up. The person who created the label,the person who put the sausages on the butchery shelf (who may very well have been someone different from the labeller), the check-out operator - and me! "We agree with the UN when its says that the severe pain caused by tasers could be seen as a form of torture and could even kill someone," Mr Harawira said. "The last time I checked the job description of this country's police force I didn't come across any duty to torture people. "We realise there are dangerous people out there, but we also know there are innocent people out there and therefore we don't want tools of torture in the hands of police or anyone else for that matter. So there are dangerous people out there, and there are innocent people out there. And yes, we do all know that. We also know it is the job of the police to protect the innocent people from the dangerous people. In the pursuit of fulfilling that expectation the police are given tools like batons and dogs. We don't make a song and dance about the possibility of innocent people falling foul of batons and dogs, both of which could kill inadvertently. Both of which are capable of inflicting severe pain. I just don't get Hone Harawira sometimes. A near dis-arse-ter trying to add a bog-roll - sorry - blogroll. I had to upgrade my blog first. What should have been a three minute exercise turned into three hours after I lost my site meter and couldn't figure out how to reinstall it. On trying to copy the html for it into the new template I was playing around with I lost the lot. I thought the new template was easier to read, changed to that and then remembered lots of people don't like change so reverted back. After three and a half years - that's how old my blog is, not how long it took - I was feeling like a new look but then again, there is probably something to be said for branding. Hope you find the new list useful. Watching TV3 news last night we saw Mt Albert Labour candidate David Shearer putting his foot right down his throat inferring that growing unemployment in migrant communities would lead to more crime emanating from them. He was appearing on an Indian TV programme. Initially the remark is directed towards the people of the interviewer, but Shearer swerves and instead directs it to Pacific people. You can see the brief item and ensuing comments over at Whale Oil. Some seem to think Shearer was right. Trevor Mallard comments, Looked pretty good to me. Certainly more articulate than monday's postcabber. I think he was wrong. I think his comments were thoughtless and ill-considered. Pacific people do have disproportionately high unemployment rates and Shearer's recent data was correct. But they do not commit crime at a rate disproportionate to their share of the population. Shearer's was the typical laziness of thinking that lumps all brown people, especially polynesians, together. Some ethnicities do better at supporting each other through unemployment. Some ethnicities have stronger families. Rising unemployment does not automatically lead to more crime. Talk about betting on two flies climbing up a wall. The Australians are now gambling on the unemployment rate. I was turning that one over when I started reading about Monday's hikoi to protest the omission of guaranteed Maori seats from the Super City council. It's going to be a biggy. Maori are amazingly effective at mobilising the troops. But I am picking many Pakeha will be joining them. One estimate is that 6,000 will turn out. Umm. Perhaps we could be betting on that. I will listen to JT and Willie Jackson this afternoon promoting the hikoi, listen to the feedback and then take a stab at it. Seems to me Auckland is in the mood for a huge bun fight. Between 2003 and 2005 hundreds of e-mails were stolen from the Leader of the Opposition. You are all familiar with the subsequent details. Mercifully Don Brash is not going to let the ensuing corrupt cover-up die a death. Good for him. Anybody who doesn't support his call for a Commission of Inquiry into the police handling of his stolen e-mails should examine their motives. As Brash says, it isn't about him. It is much bigger than that. Many New Zealanders are far too smug and complacent about their country being corruption-free. Others want to turn a blind eye to this issue simply because they don't care for Don Brash. Others won't brook any criticism of the police. Others will want it buried because it is a very bad look for one or other of the two main political parties. They are all illegitimate, unworthy, evasive cop-outs. I'm not a bit surprised that Mr Dunne has expressed his displeasure at Ms Rankin's appointment since the last thing a fence-sitter needs is for someone to shake the fence. The Commission will not work on behalf of individual families, but will advocate on behalf of all families, in all their forms. It will not be prescriptive about what a family is, or what form it should take. This approach guarantees and sanctions the continuance of family formations that rely on the state. If the Families Commission was ever going to achieve anything it would have been to question what role government has played in weakening families, not what role it should play in strengthening them. But no. They took the easy, anything goes, approach. Rankin is undoubtedly in the marriage-and-two-parents-is-good-for-children camp. The same camp I would have thought as Dunne. So I think his fierce opposition must come down to personality. The sometimes purse-lipped Mr Dunne must disapprove of Rankin's style more than her substance. Or he suspects that Rankin could threaten the very survival of his Commission and he would rather have it as the useless entity it is than not at all. That would be somewhat pathetic. Whatever is behind his opposition isn't well-motivated. He isn't a left Liberal yet is taking their side. Perhaps it is just the usual 'putting Peter first' modus operandi we have all come to know....which I guess is what Garth George was saying. What a colossal waste of parliamentary time. Hon Paula Bennett (Minister for Social Development and Employment) replied: I refer the Member to the Ministry of Social Development’s quarterly benefit factsheets, which are published on the Ministry’s website (www.msd.govt.nz). This is also my response to written parliamentary questions 6219 to 6285 and 6304 to 6377 (2009). Some of the questions asked for information about non-quarterly totals which wouldn't be published but 140 questions could nevertheless have been condensed into 3 or 4 quite easily. Perhaps filibustering has become institutionalised. And the irony. The only other time Darien Fenton has come to my attention was when she was whining about New Zealanders working too hard. Ms Fenton says the time has come to change the way people think about how many hours they should be working. She believes employers should also take a good hard look at how much work they throw at staff. We mustn't laugh though. We are paying for it. A newborn girl can expect to live an average of 82.2 years and a newborn boy 78.2 years, Statistics New Zealand said today. These levels for 2006–08 represent longevity gains of 1.1 years for females and 1.9 years for males since 2000–02. Since 1975–77, life expectancy at birth has increased by 6.8 years for females and 9.2 years for males. This has resulted from reductions in death rates at all ages. Any suggestions as to why? Be as frivolous as you like. An advocacy manager for Unicef NZ has written a piece in this morning's DomPost resisting the suggestion that more 12-13 year-olds be dealt with in the Youth Court. To background it, 12 and 13 year-olds are currently dealt with through family conferences and the Family Court as a last resort. .....the family group conference and Family Court system provide the best opportunity for rehabilitation...our youth justice system is highly regarded and has a reputation in New Zealand and abroad for achieving good results....our youth justice system is enlightened and reasonable - we just need more of it. The reader should by this stage be feeling moderately confident that youth offending in New Zealand is comparably low then. But no. The legislative act that created our current system is 20 years old. I would have thought that if it isn't achieving after this length of time there is good cause to change it. But Unicef typically clings to past ideas. Not unlike the socialists clinging to discredited economic theories. Here we come back to the thorny old issue of the age of culpability. The problem is that at 14 society says a child becomes a youth and commands a different justice approach. At 12 and 13 he is an innocent wee thing upon whom all our best collective endeavours should be visited to steer him away from "embarking on the path to criminal notoriety." It is unlikely that a 13 year-old will understand the technicalities, complexities and consequences of criminal charges. But the day he turns 14 he will? Let's face it, many people of many ages do not understand the technicalities and complexities of charges - but they sure as hell understand the consequences - very often, bugger-all. And they understand the consequences of their crimes in personal terms. They got something they wanted, whether it was material or mental. And it was worth the risk to get. There is already police flexibility at the charging level and judicial flexibility in the court. Extend it. If the severity and frequency of the offending is serious, a 12 or 13 year-old should not be unduly protected. Taking the following report purely at face value, can you imagine how aghast people would have been if they could have foreseen this sort of carry-on 40 or 50 years ago? The trial of a Christchurch father charged with assaulting his two sons starts today. Jimmy Mason was charged in January last year after he allegedly assaulted his two sons, aged two and four, by flicking their ears. He argues he was disciplining his children for riding their bikes dangerously. The trial in the Christchurch District Court is set down for two days. Again, taking the report purely at face value my own fleeting thought is these boys are lucky to have a father that cares about them. 40 or 50 years ago, a father in the dock on charges relating to his children was likely being prosecuted for non-support - and quite possibly jailed as a consequence. Today if the father fails to support his kids we just shrug and do it for him. But, woe betide any that take their role seriously albeit outside of post-modernist precepts. Or in non-academic terms - uses some old-fashioned discipline.